Not a lot to write about today. 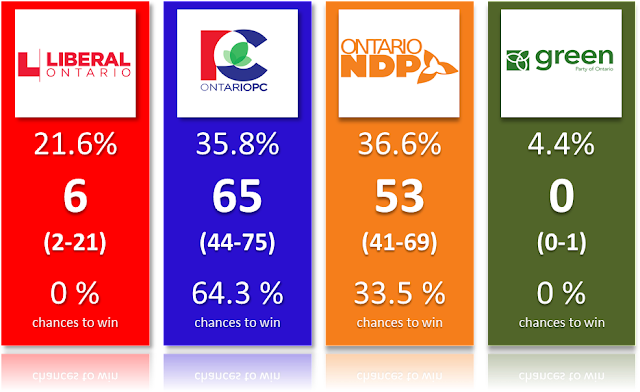 While Forum did come out yesterday with the NDP at a crazy 47%, other pollsters seemed to agree the race was much closer. 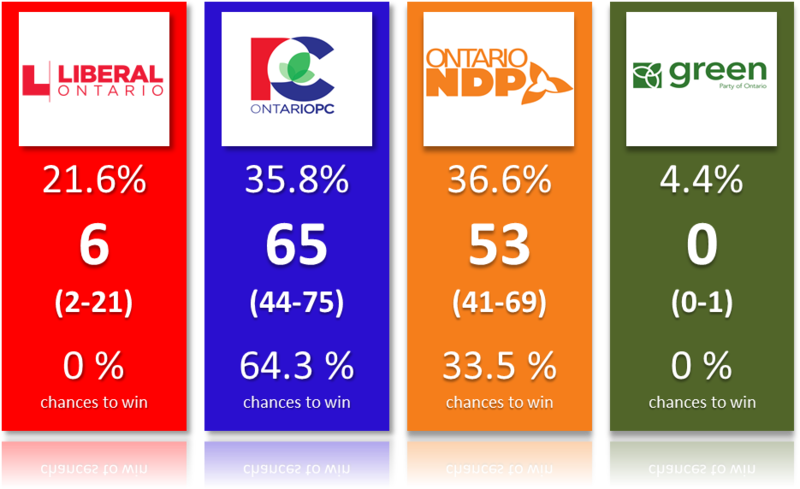 Ekos, after leaking some partial results the day before showing the NDP up by 10, ultimately published a full poll with PC and NDP statistically tied. Abacus said on Twitter that they weren't observing a crazy NDP break-out beyond what they had already observed (interesting because Abacus was one of the first to catch the rise of the NDP a couple of days ago) and Mainstreet's tracker is slowly but surely converging to a close race. Finally, Innovative went kinda against the trend by publishing a poll with the PC still relatively comfortably ahead. It should be noted however that the Innovative poll was conducted from the 18th to the 23rd, so it's possible it didn't capture some of the NDP's jump that happened recently. So, turned out that my long analysis of yesterday where I was showing the edge the PC has with vote efficiency is still valid and relevant! Yeah! By the way, you should definitely read this analysis! Here below are the most up to date projections. Mainstreet also started publishing some riding polls, namely in Ajax and Guelph. Riding polls are by far less accurate but I can't ignore them. After all, I need to make projections because we don't get 124 riding polls. So when there is one, I include it in my forecast. I can't reveal the exact numbers in Guelph but let's just say that the poll confirmed the Green leader Mike Schreiner is in the race. It's always very difficult to predict such a race where one party is putting everything it got into this one riding. Past results of Mike Schreiner didn't seem to indicate a crazy personal effect (as opposed to Elizabeth May or Andrew Weaver for instance) but it seems this is working better this time around. To be fair, Guelph is most likely a better riding and the vote is so split that it takes a low percentage of votes to win this year. So can he win? Yes, absolutely. But it remains a 3-way race with the PC and NDP (even the Liberal candidate isn't fully out). So the big change of the day is the confidence interval for the Green now being 0 to 1 instead of 0 to 0. Beyond this, I don't have anything to add for now. Enjoy your Saturday! Is there some vote splitting in Ontario? Can you get a quality poll for $200? Can we trust Canadian polls? Ontario election: What is Google Trends showing?